Enjoy all of the home comforts you would expect from a four-star graded Guest House, including a coffee or hot chocolate from your personal Tassimo coffee machine, perfectly matched with our home made shortbread, wi-fi in all rooms and breakfast cooked using locally sourced fare. Our four-poster rooms have a beautiful collection of antique furniture. All of the rooms are decorated to a high standard with your comfort in mind. 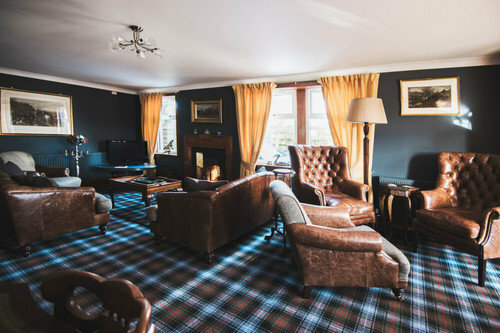 Balsporran Bed and Breakfast is nestled in the Drumochter Pass, in the Cairngorms National Park. The perfect setting to escape, explore, relax, indulge and experience nature at its best. All rooms are en-suite, have digital LCD televisions, Wifi, radio, alarm, hairdryer, tea coffee making facilities and tourist information. Enjoy a hot drink and homebake served in our guest lounge on arrival. We provide private parking, and a drying room with boot dryer for outdoor clothing. Safe storage of cycles, skis, snowboards, golf Clubs. Craiglea now provides Cycle Hire. For 2016 our hire bikes are the GT Avalanche 4 hard tail mountain bike. Around Braemar and the surrounding countryside there are trails to suit all abilities whether it's a gentle pedal admiring the views or a strenuous all day adventure. AM/PM 1 Day 2Day 3Day 4Day £10.00 £16.00 £27.00 £37.00 £46.00 With your bike hire, helmets, maps, route cards, locks, pump, and spare inner tubes are provided. Packed lunches are available by prior arrangement. Children are welcome. A cot and a high chair are available.